Although mentioned briefly in my first A view from the line post the ash pit gang are still working hard at the never ending task of removing the ash that accumulates around the sheds external pits. 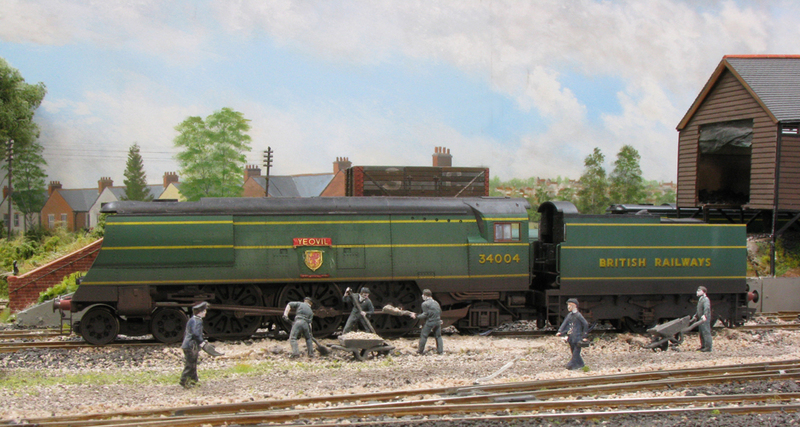 When a locomotive comes on shed at the end of its duty it is ‘disposed of’ either by the loco crew as part of their shift or by dedicated shed staff from the ‘preparation and disposal’ gang. This gang sometimes comprised of loco crew on ‘light’ duties or near retirement who have come off main line working. Disposal of the locomotive involves dropping the fire and clearing the grate from any clinker, removing ash from the smokebox, refilling the tender or bunker with coal from the coal stage, topping up the tender or tanks with water from the shed’s water cranes and turning on the turntable if required depending on the engines next allocated duty. The engine is then left in the required stabling position on the shed as advised by the shedmaster, although the fire has been dropped there is usually enough steam left to enable to final moves around the shed to take place. Getting back to the ash pit gang, their role was to clear from around the shed the pile of ash and clinker that result from the disposal of the engines. This would be shoveled into wheel barrows before loading into open wagons that would occasionally be drawn into the shed area when the road was clear of engines. This was a particularly unpleasant job especially during dry and windy weather when the ash, quite often still warm / hot at times, would easily get blown around including into eyes and making breathing difficult to say the least, so spare a thought for the conditions that these men worked in. On Fisherton Sarum my ash gang are cast white metal figures from the Geoff Stevens’ range that comprises of 2 wheelbarrows (1 full, 1 empty), 2 men shovelling, 1 man pushing barrow, 1 man digging, I have used a number of the Geoff Stevens’ range of figures including cleaners etc. at various positions around the shed. The ash is in fact real ash from my wood burning stove, fixed in place with the time honoured method of diluted PVA glue. An open wagon is regularly shunted into the ash pit road next to the shovelling gang for loading. As in 4mm scale it is tricky for a wagon to fill itself, in reality the wagon arrives and departs half full!